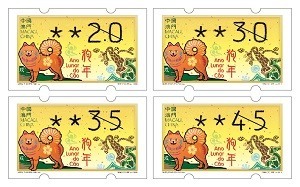 Stamp Issue "Lunar Year of the Dog (Label Stamp)"
Macao Post and Telecommunications Bureau issued the label stamps “Lunar Year of the Snake”, “Lunar Year of the Horse”, “Lunar Year of the Goat”, “Lunar Year of the Monkey” and “Lunar Year of the Rooster” under the stamp series of Chinese Zodiac between 2013 and 2017. 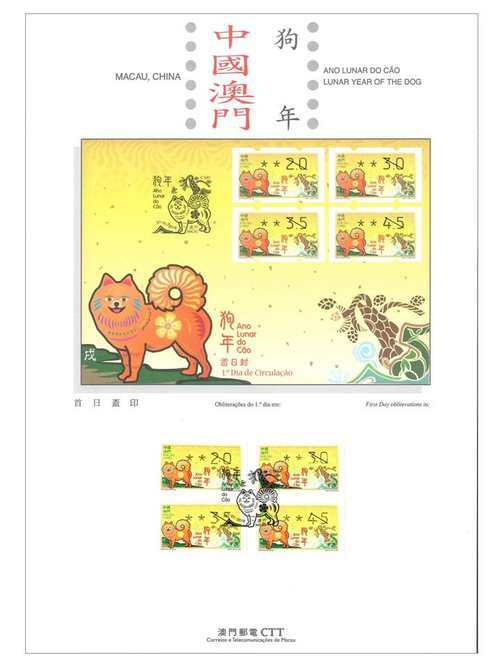 The sixth issue with the stamp theme “Lunar Year of the Dog” will be issued on 31st January, 2018, the printing quantity is 1,000,000 label stamps. 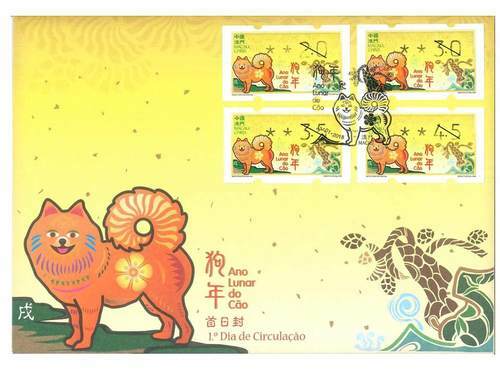 The dog comes in the 11th place in the sequence of the 12 animals in the Chinese zodiac, and corresponds to “xu”. It is also in the 11th place among the 12 “Earthly Branches”. In China, the 12 earthly branches are used to indicate the hours of the day, being the “hours of xu” (from 7 o’clock to 9 o’clock in the evening) which is also called “hours of dog”. Since they are nocturnal hours, with dark sky, the dog, like a guard, remains alert to safeguard the door and secure the house. Thus came the Chinese expression “guard dog at the door”. The dog is a close companion and faithful to man. The dog is known for its loyalty, not betraying the owner in any situation. So much in China as in abroad, frequent and common are the beautiful stories and news of dogs that saved a life or vindicated its owner. 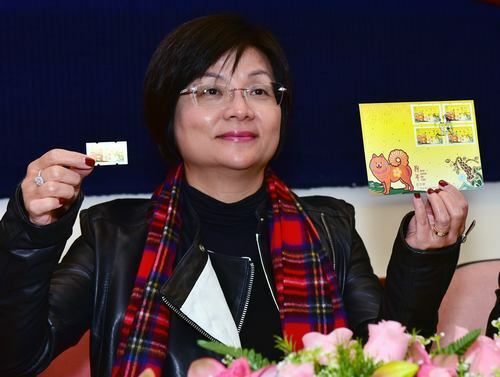 On the issue date, the maximum sales quota per queuing customer is 20 sets of label stamps, 5 first day covers with label stamps and 5 information brochures with label stamps. Besides, the following designated automatic stamp vending machines will have a temporary arrangement; the maximum time limit for using the vending machine is 10 minutes for each queuing customer. This is the first theme in 2018. 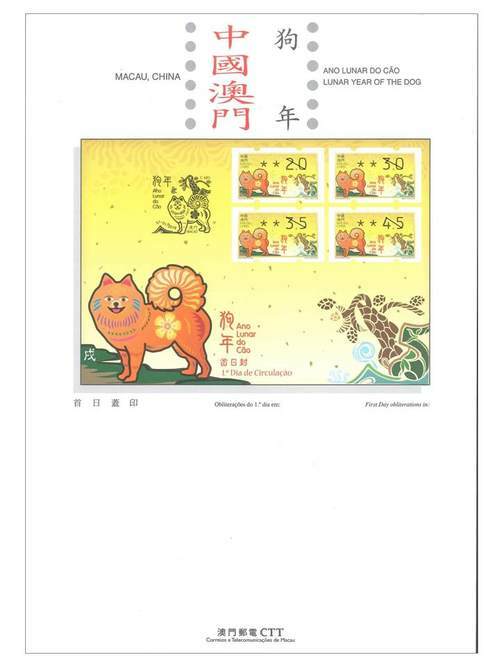 The theme “Lunar Year of the Dog” also included the commemorative stamp issued on 05/01/2018.